Oven Alchemy - The Maghreb Times ! When I serve kale for dinner, I carefully divide it among my family of four. My kids watch to make sure everyone gets an equal amount then immediately devour their portions once we sit down to dinner. I don’t say this to brag about my eat-anything, health-conscious children. My kids, ages 11 and 8, can be frustratingly picky. My son claims to hate chicken. My daughter is terrified of sandwiches made with anything other than peanut butter and bread. She eats her burgers plain and dry—just the meat and bun. We all fight over kale because of the way I prepare it. I don’t steam or sauté it. I tear the leaves into large pieces, toss them with olive oil and salt, spread them on a baking sheet, and then roast in a hot oven. The result is a salty, earthy, slightly sweet taste that’s irresistible and addictive. This is the alchemy of roasting vegetables, and it will change the way you think about eating them. Roasting enhances the vegetable’s flavor and allows the natural sugars to caramelize, bringing out a slight sweetness. 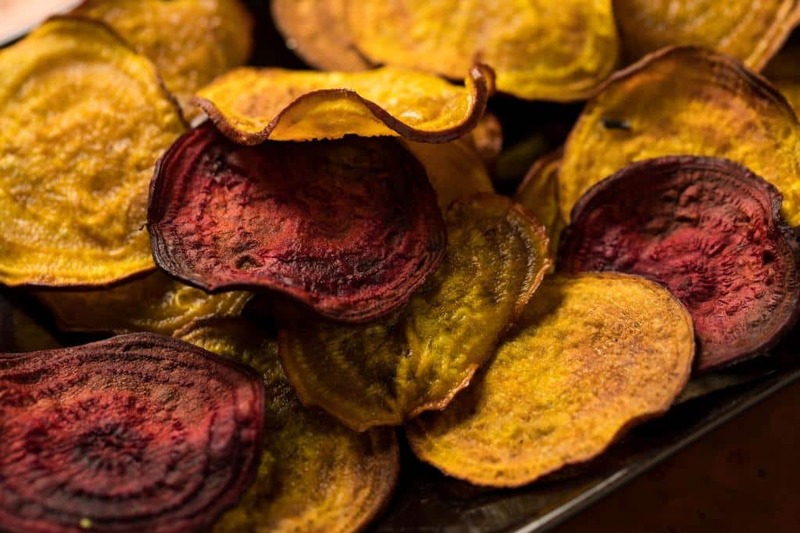 It’s the same with broccoli, cauliflower and beets, which I slice thin and turn into beet chips. They’re all vegetables my kids would pick at when steamed, but they’re devoured after a little time in a hot oven. Once I got hooked on roasted vegetables, I began serving them at least twice a week in the fall and winter. One day this fall, while tossing broccoli florets with olive oil, I had a moment of panic. Roasted vegetables taste so good and the kids eat them like candy—what if that’s because they’re actually unhealthy? After a nervous Google search along the lines of “is roasting vegetables healthy,” The New York Times came to the rescue. According to the August 2016 article, roasting vegetables does change the nutritional profile and diminish some nutrients, but it can make others easier to absorb. To avoid creating deficiencies, it’s always better to vary how you prepare your vegetables, rotating raw, roasted, steamed and sautéed fare. But if it’s a choice between no vegetables and roasted vegetables, the latter is clearly superior. According to bestfoodfacts.org and prevention.com, no evidence supports the claim that using olive oil for high-heat cooking is unhealthy. Heating an oil too much—past the smoke point, when the oil goes from shimmering to smoking—is something to avoid when cooking for other reasons: For some oils, especially raw or virgin oil, heating past the smoke point causes the fat to break down and can lead to a burnt, bitter flavor. Some oils, such as safflower oil, have a smoke point of 510 F. Extra-virgin olive has the lowest smoke point at about 325 to 375 F. The beauty of roasting is you are using indirect heat, as opposed to the direct heat of a stovetop, so it takes quite a long time for the oil mixed into the vegetables to reach high temperatures. Some vegetables, such as Brussels sprouts, work best when the oven is very hot. Both Brussels sprouts and broccoli can give off a sulfurous aroma when cooked incorrectly. By blasting them with heat, the outside caramelizes and browns and the inside becomes tender. Cauliflower also does well at high heat. With the higher heat the cooking time is faster, usually around 20 to 25 minutes. Root vegetables, such as carrots, parsnips, onions and potatoes, do better at 400 F for closer to 45 minutes. Cut the vegetables into pieces that are the same size. If your broccoli florets are wildly different sizes, they will cook at different rates, and you’ll end up with some burned, some undercooked. You don’t have to get out a ruler, but aim for pieces of similar size when prepping your veggies. Line your baking sheet. This is something I don’t often remember to do because I’m usually in a rush, but sometimes the process of caramelizing leads to a burned pan. You can line with foil, parchment paper or a reusable silicone baking mat that rests inside the baking sheet. Give the veggies some room. When the vegetables are overcrowded, they will steam and become soggy instead of caramelized and deliciously crispy. Give the vegetables plenty of space: They shouldn’t touch each other. Flip or stir halfway through. Roasting vegetables is not like roasting meat. You need to flip them over halfway through the roasting time to make sure each side gets well roasted. This is the roasted vegetable that started it all for me. I always cringe when I see kale chips sold in the store; they are insanely expensive. Walk right past those bags of prepared kale chips and head directly to the produce department. Remove the kale leaves from the stems. An easy trick for doing this is to hold the end of the stem with one hand and place the pointer and thumb of your other hand on the stem, just above the leaves. Slide your fingers along the stem, tearing the kale leaves off as you go. Tear the leaves into larger-than-bite-sized pieces (they will shrink quite a bit in the oven) and place in a large bowl. Add 1 tbsp. of olive oil and toss with your hands. The kale should be lightly coated with oil. If the leaves seem dry, add another tablespoon of oil. Spread the kale evenly onto the two baking sheets and sprinkle with salt. Bake for 12 to 15 minutes, tossing the kale once halfway through and switching the position of the baking sheets. 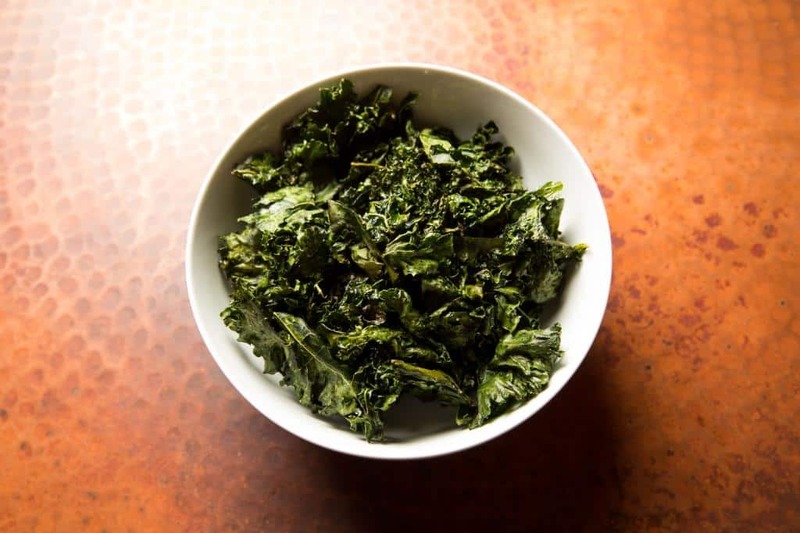 Once the kale chips have been in for 10 minutes, check frequently so they don’t get burned. 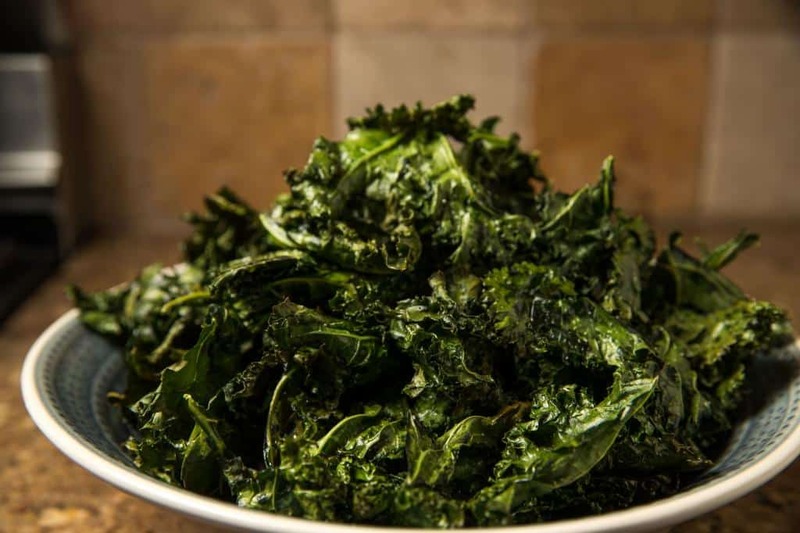 Let the kale cool, add salt to taste, and try to eat some before everyone else gets to it. 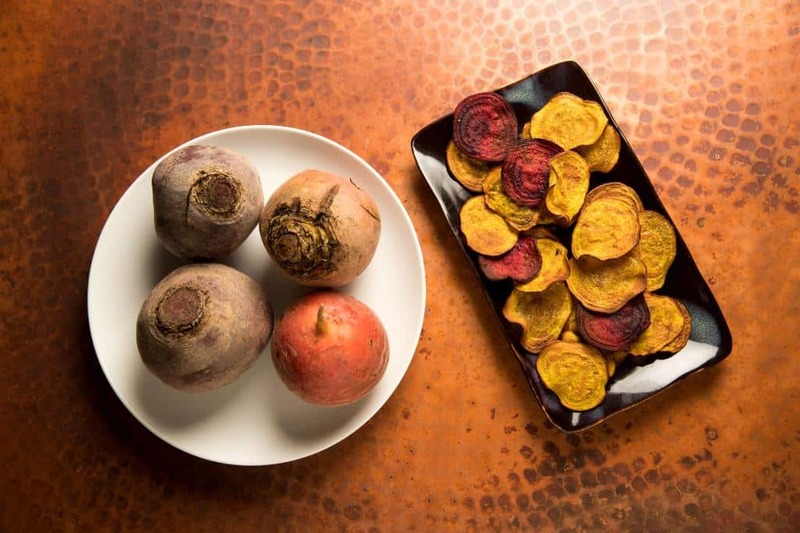 If you’ve never loved eating beets, try this recipe. Slicing the beets thin and baking them completely transforms their flavor. Cut off the ends of the beets, then slice as thinly as possible with a mandolin or sharp knife, placing the beet slices into a large bowl. Drizzle the beets with olive oil (about a tablespoon or two) and sprinkle with salt, then toss with your hands. The beets should be lightly coated with oil, not drenched. Divide the beets between the baking sheets, placing in a single layer and making sure they don’t touch. Roast for 20 minutes until crispy and browned. Halfway through baking, take the baking sheets out of the oven and use tongs to flip the beets over. Switch the position of the baking sheets when you return them to the oven. Start checking at 15 minutes, being careful not to let the chips burn. Add salt to taste. Preheat oven to 425 F. Line a rimmed baking sheet with parchment paper or a reusable silicone baking mat. Cut broccoli into florets of equal size. You can use some slices of the stem as well, avoiding the tough part of the stem at the end. 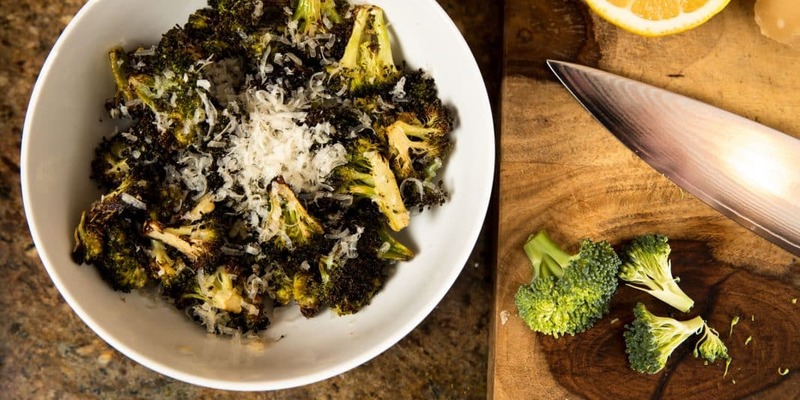 Put the broccoli in a bowl and toss with olive oil, salt and lemon juice. Roast for about 20-25 minutes, tossing halfway through, until tender, crispy and browned. 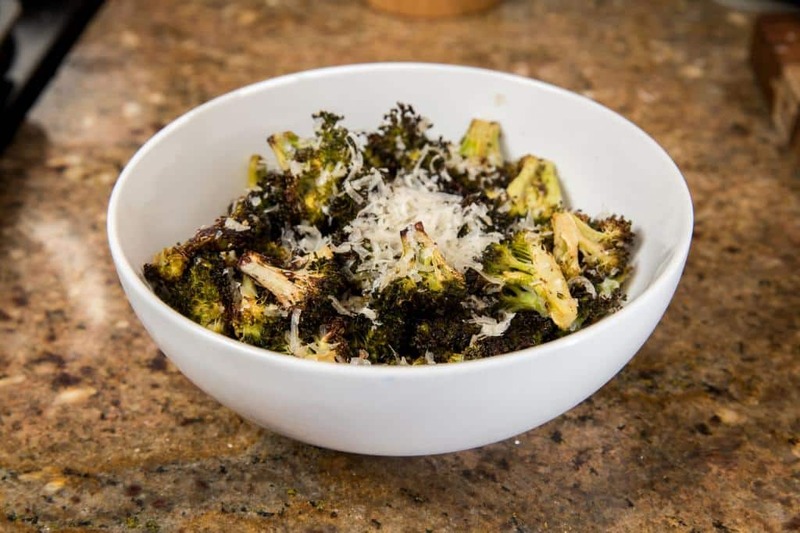 Sprinkle Parmesan cheese over the broccoli, toss and serve.